Fire hose is perhaps the most important piece of equipment carried on a fire appliance. 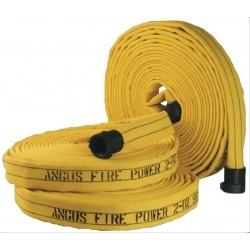 It is the fire fighter's lifeline. If it fails, your life could be in danger. That's why it's so important to use the best, and don't all fire fighter's deserve the best? As the world's first ever covered fire hose, Duraline is the benchmark hose that sets the standard other hose manufacturers have to meet. Many have tried, but none have succeeded. Their imitations look like Duraline, and their brand names even sound like Duraline. But remember, if it isn't Angus, it can't be Duraline!